One of these days I'll manage to take a photo of myself that doesn't look like I'm also selling tickets to a gun show. Hello, there, awkward bicep. I had actually "put myself together" (so to speak) by 8:00AM this morning, and fully intended to reward myself with breakfast at Starbucks. Instead, I decided I was too lazy to make the drive, and made myself the perfect cup of coffee (I added cinnamon to the coffee grounds and a bit of french vanilla creamer after it had brewed) and ate whatever leftover raisins and cheese Eisley left on the coffee table. I recently hung out with a friend who tied her scarf in a fantastic way. Instead of acting like a normal human being and asking her how she did it, I just stared intently at her scarf for a few moments and decided to try to recreate the look later. 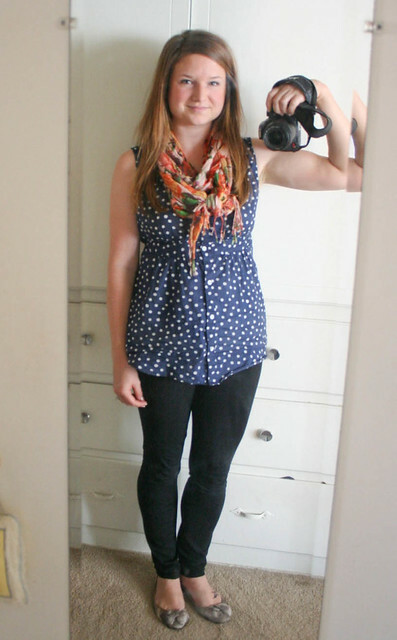 And I think it mostly worked to my advantage, because this is the only way I'm wearing my scarves now! 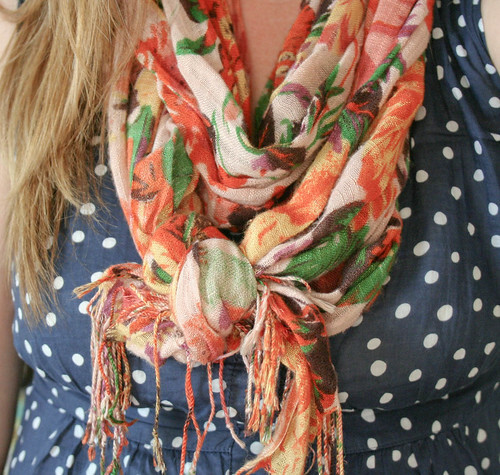 I simply tie the ends of the scarf into a knot, then wrap it around my neck twice (like an infinity scarf). I like the way it stays put and I don't have to rearrange it much throughout the day. I've had an addiction to buying flats from Payless for years and years. This is a pair that I purchased a few years ago—a style I ended up buying two identical pairs of because I loved them so much. Comfy, adorable, inexpensive. Payless, you speak my love language. i always love your blog! 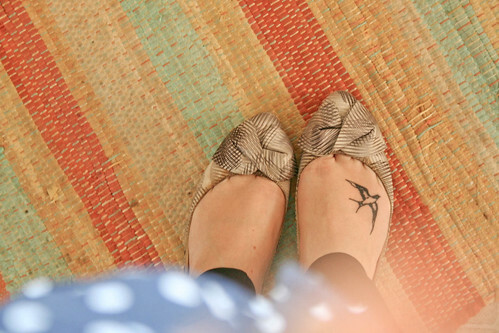 Payless flats are amazing. I have a pair from them, which are American Eagle brand and they have been put through walking, biking and so much more. Love them!! !